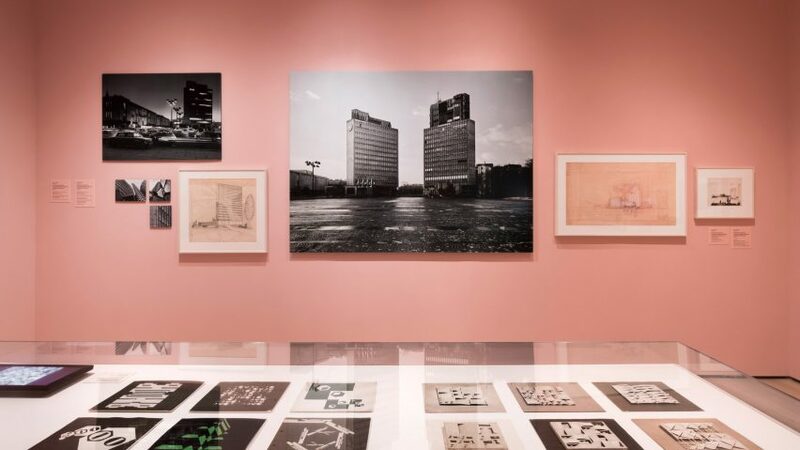 The impressive monuments, ambitious masterplans and unrealised visions of architects across socialist former Yugoslavia are the subject of an exhibition at New York's Museum of Modern Art. Toward a Concrete Utopia: Architecture in Yugoslavia, 1948-1980 explores the use of building and urban planning to create a national identity for the country during its 45-year existence. Spread across the The Robert Menschel Galleries on the museum's third floor, more than 400 drawings, models, photographs, and film reels present the evolution of Yugoslavia's built environment as it politically and ideologically positioned itself away from both the Soviet Union and the West. "The exhibition investigates architecture's capacity to produce a shared civic space and common history in a highly diverse, multiethnic society," said a statement from MoMA. Yugoslavia was formed in its entirety after the second world war, joining several socialist republics and provinces across the Balkans peninsula in southeastern Europe. However, following the death of its leader Josip Broz Tito in 1980, the country broke up and subsequently endured bloody wars from 1991 to 2001. The region is now spilt into the nations of Croatia, Serbia, Bosnia and Herzegovina, Macedonia, Slovenia, and Montenegro, plus the still-disputed territory of Kosovo. MoMA's exhibition focuses on the period of advancement during Yugoslavia's heyday. Parts of the region were heavily damaged during the second world war, so concerted rebuilding efforts were required, along with major construction projects to assert the new nation's prowess and ideals. The first part of the exhibition investigates modernisation in the country, and how this led to structural expressionism that spanned from the International Style to brutalism, for buildings intended to improve social standards. Grand public structures like stadia, museums, libraries and educational facilities – as well as private ventures such as hotels and office towers – went up across the country, all with daring forms made possible by advances in concrete construction techniques. "Tasked with constructing a socialist society based on 'self-management', modern architecture was a key instrument in the implementation of a utopian vision in a perpetual state of emergence; many of the featured visionary projects and executed buildings speak to architecture's aspirational role in terms of both design and social impact," said MoMA's statement. Sections of the exhibition highlight specific large-scale projects, including the creation of the new federal capital, New Belgrade, which involved producing multiple housing blocks and civic buildings. One area is dedicated to the reconstruction of Skopje, which was devastated by an earthquake in 1963. Japanese modernist architect Kenzo Tange came up with a radical masterplan for the city, which included a vast City Gate and City Wall, although the majority of his was never built. However, several important examples of brutalist architecture did make it to completion in the Macedonian capital. Among them are Janko Konstantinov's Telecommunications Center, Georgi Konstantinovki's Goce Delčev Student Dormitory, and Marko Mušič's Ss Cyril and Methodius University Campus. Another part of the exhibition shows the plans for rebuilding Zadar, which was heavily bombed during the second world war. Much more of this modernist vision came to fruition, including museum buildings and housing along the Croatian city's waterfront. Smaller rooms focus on the region's most important architects of the time, such as Bogdan Bogdanović – who was heavily influenced by surrealism – and Juraj Nedhardt, who aimed to create a regional version of modernism based on the Ottoman vernacular. Toward a Concrete Utopia's final section is dedicated to the giant sculptural monuments erected across the region in the 1950s and 1960s to commemorate the victims of the second world war. These include sculptor Miodrag Živković's Monument to the Battle of Sutjeska in Bosnia and Herzegovina, comprising a pair of huge jagged forms the splay away from each other, and Marko Mušič's faceted-roofed Memorial and Cultural Centre, and Town Hall in Montenegro. Throughout the exhibition, specially commissioned photographs by Valentin Jeck are blown up and displayed alongside original architectural drawings. These prove that many of the projects were realised, rather than remaining as pie-in-the-sky visions, and are possible to visit today. Toward a Concrete Utopia is organised by MoMA's chief curator of architecture and design Martino Stierli, Florida Atlantic University associate professor Vladimir Kulić, and MoMA curatorial assistant Anna Kats. The exhibition opens to the public 15 July 2018 and runs until 13 January 2019. Also currently on show at the museum is a retrospective of fantastical architectural models by late Congolese sculptor Bodys Isek Kingelez. Its previous recent exhibitions have included an investigation into the history of iconic fashion designs, and a major showcase of work by architect Frank Lloyd Wright.